If we're to believe hundreds of Jews were filed into a room then "gassed" via hydrogen cyanide, what happened to the all of the poison air in the lungs of the victims after the process was over? In other words, after the alleged "gassings", the story is other prisoners were forced to lug out the bodies from the pile. But... the poisonous gas would still be in the lungs of those bodies, and any movement or pressure against the chest cavities of those bodies would expel the gas from them. Wouldn't that cause anyone who attempted to move the bodies to drop dead on the spot? After all, they were in the same room allegedly used to murder hundreds at a time, right? So what's stopping the gas from the victims' lungs from killing anyone who stepped on, moved, or even dropped the bodies while being removed? Maybe they were following the camps health and safety procedures for when handling dead bodies and used gas masks? How many people would they have to send in to remove hundreds of bodies for the next oblivious group to be gassed? How many gassings they could fit in a day? And who would be gutless enough to help remove the bodies? Because I don't know about you guys, but I'd figure if that's what they were doing I'd warn the next group and refuse to co-operate if I was going to share the same fate anyway. 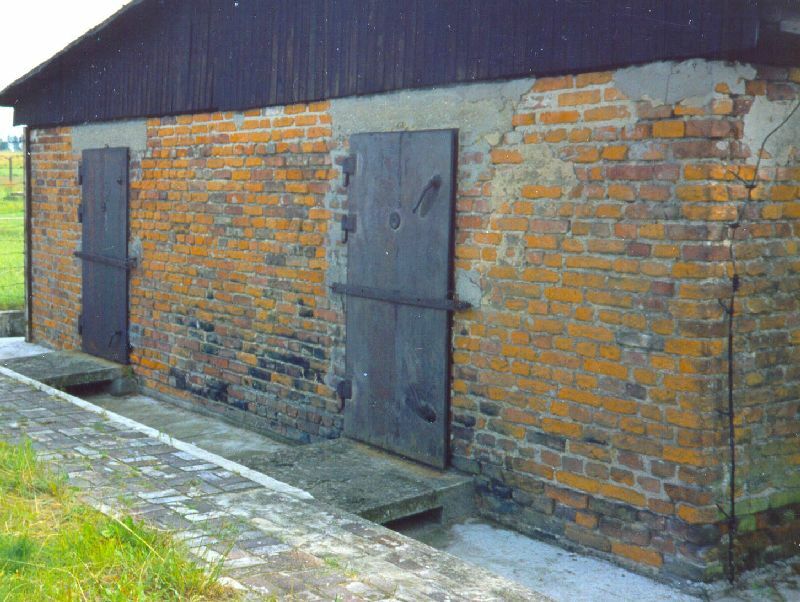 Zyklon B fumigation chamber in Stutthof camp, east side, exterior with Prussian Blue stains. Last edited by trevor on Sun Mar 27, 2011 3:24 pm, edited 2 times in total. Älghuvud wrote: I am also a skeptic. But what about this one? Finally, the undeniable evidence that the SS ordered Degesch to remove the indicator odor, mandated under German law, which was added to the Zyklon B in order to provide a warning to human beings that the lethal stuff was nearby. - There was no SS order to remove the odor from Zyklon-B, no order has ever been shown, nor can it be shown. The removal of the warning scent was decided upon by DEGESCH and not by the SS. This came out during testimony given by Mr Breitweiser during the course of the Auschwitz Frankfurt trial in 1961. Breitweiser was in charge of disinfestation at Auschwitz. He was never charged with or convicted of a crime. Wroclaw over at JREF responded to this. 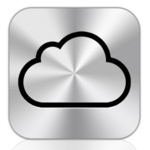 "The evidence code for the IMT document is NI-1210. I've seen the originals, but I don't have them anymore at hand." "I don't think there was one regarding Zyklon-B "
Jazz wrote: Maybe they were following the camps health and safety procedures for when handling dead bodies and used gas masks? How many people would they have to send in to remove hundreds of bodies for the next oblivious group to be gassed? How many gassings they could fit in a day? This does create an issue for the time line of Believers. I haven't checked the site's search function yet, but I'm sure the amounts of gas masks requisitioned by (and shipped to) the camps have been discussed and documented previously. Obviously, the more dead claimed in each alleged gassing, the more people needed for the removal of the dead full of the harmful gas. The more people for removal, the more masks needed, which means more filters for the masks. It's common knowledge that you can't keep using the same masks without changing the filters, or they are rendered useless causing death to anyone who was exposed to the supposed "instrument of death" known as Zyklon B. There's only so many workable hours in the day (even in "evil Germany"), and to maintain the numbers of dead being removed (alleged gassings by the thousands at a time), there would have to be a pretty strict regiment and a materials list being monitored and filled daily. Of course, I'd like to see one photo of prisoners in a gas masks pulling Jews from an alleged gas chamber to quiet my curiosity, but it appears that was the only aspect of the camps that wasn't photographed (even though they were supposedly happening all day, every day to maintain the numbers claimed). Too bad we can't use HTML here as there are tags for both subscripts and superscripts, the latter of which are used in chemical formulas. 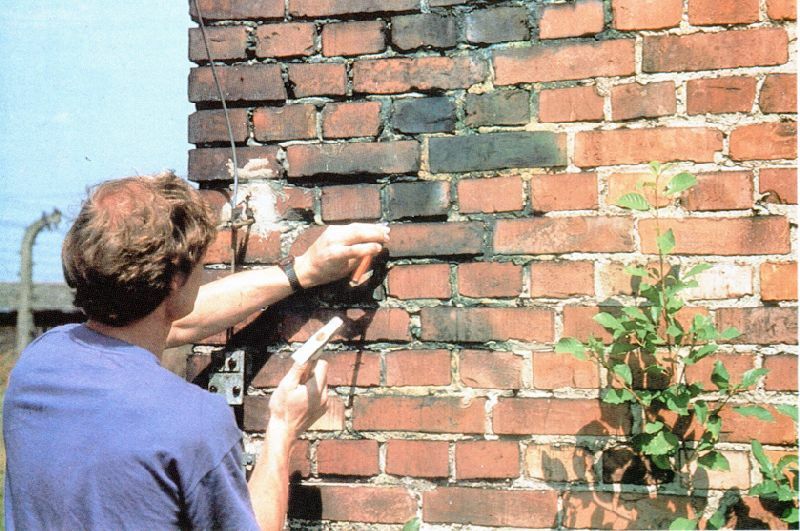 I have a question - does the delousing chamber bricks have blue staining INSIDE the brick? If the cyanide went through the brick, the entire interior of the brick would be blue, because there would have been both iron and cyanide throughout the interior. AHUGECAT wrote: I have a question - does the delousing chamber bricks have blue staining INSIDE the brick? If the cyanide went through the brick, the entire interior of the brick would be blue, because there would have been both iron and cyanide throughout the interior. It would have necessarily penetrated the brick from the inside in order to reach the outside. Seems like someone is asking you a very stupid question. It also sounds like someone is telling you that blue paint was used (laughable and already shot down), or that disinfected mattresses were leaned against the structure .... another absurd canard debunked here. Have you read this entire thread? Hannover has already shown pictures of the OUTSIDE of delousing chambers HERE. It stands to reason if the outside of the bricks had blue staining, then the inside would as well, considering the delousing was performed inside the rooms, not outside. It's because brick is not easily penetrated by cyanide ions, and the iron oxide in brick is not very reactive. caption: Fig. 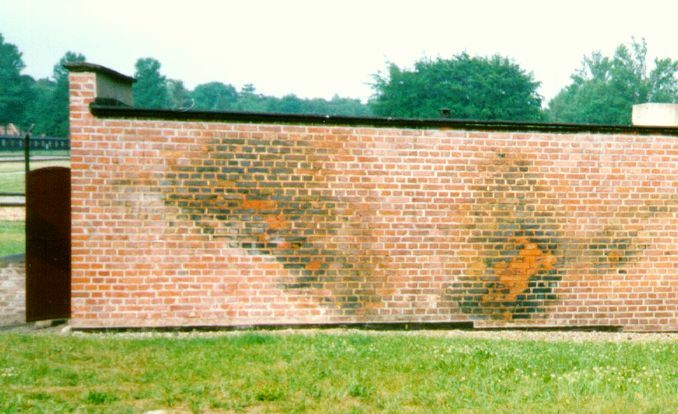 60: Exterior southwest wall of the Zyklon B disinfestation wing of BW 5b in the Birkenau camp. caption:Fig. 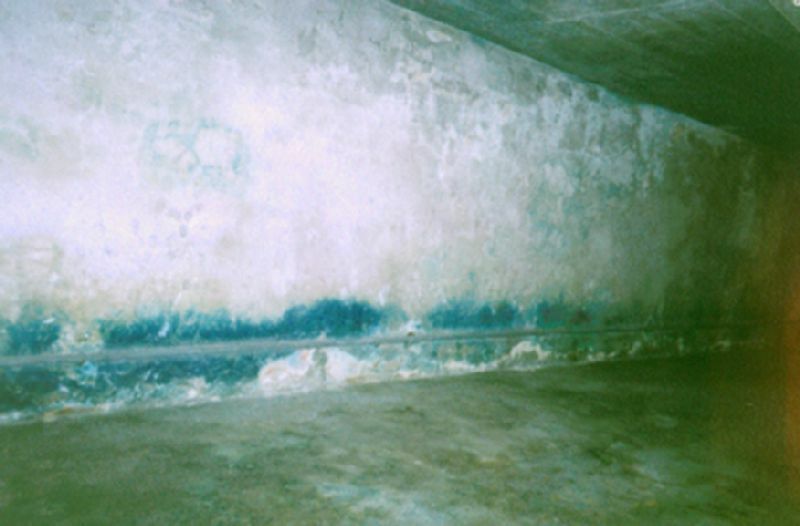 62: Zyklon B disinfestation installation, east wall of chamber III of barrack 41 in Majdanek camp. 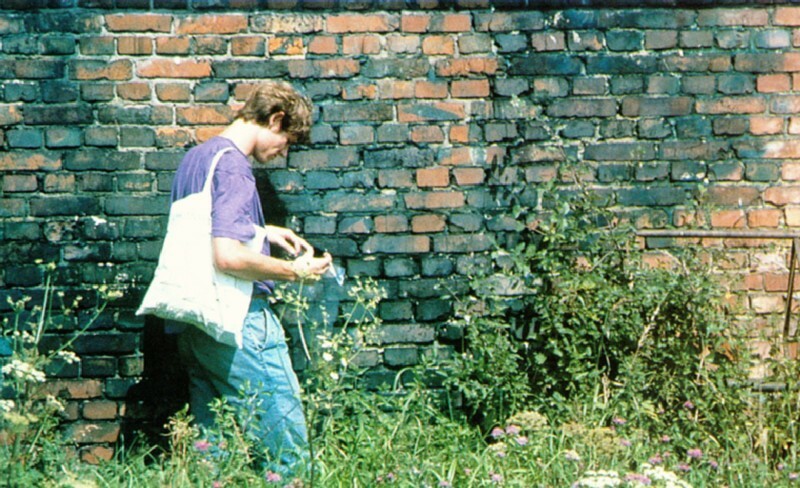 caption:Color Image 4 (inset): Exterior of a wall of the same part of BW 5a. Cyanide penetrated the wall and caused blue stains. This thread was recommend to me by Hannover in the thread “problem with document / 'Heizers' & 'Holzablader'”, who claims that it is shown here that “the 'gas chambers' as alleged” are “violating laws of science”. Now I’m curious what these laws of science which are violated are supposed to be. Hannover also claimed there that “the alleged Auschwitz 'gas chambers' are utterly impossible as alleged”. I expect here to find proof for thesis too. So let’s look at the main postings by astro3 in this thread and just check if they back up Hannover’s claim. The first is entitled “Cyanide Chemistry at Auschwitz”, which presents some of the results of cyanide testing in the Auschwitz complex. There is no demonstration of impossibility or violating laws of science with respect to the homicidal gas-chambers. Next is “The Blue Walls of Birkenau”. We learn that delousing chamber walls show spots of Prussian blue. What we do not learn and get demonstrated, however, is that homicidal gassing in crematoria had also necessarily resulted in formation of Prussian Blue. On page two it goes with astro3 writing about “The Polish Investigation”, “Geography of the Leuchter Samples”, “Depth of wall penetration”, “Wikipedia on Zyklon-B” all of which are little relevant for Hannover’s hypothesis. Next one “The Decisive Test” seems to be more relevant, at least when reading the conclusion “the hypothesis of mass extermination goes out of the window”. This is based on the observation that Rudolf and Leuchter have supposedly measured 5,600 ppm of cyanides in the delousing chambers, but only 2,2 ppm in homicidal gas-chambers. Now, as we know the high amount of cyanide in the delousing chambers comes from iron bonded cyanide. What astro3 unfortunately does not show – again! - to make the story and the argument complete is that Prussian Blue had also to form in the homicidal gas-chambers. As long as this has not been shown, absence of Prussian Blue is no proof that no hydrogen cyanide was used in the homicidal gas-chambers as described. “Dr Green's Fallacy” is about the detection limit of the Cracow Institute study. This is one of the more interesting postings at least for me. The study by Markiewicz et al claims a detection limit for cyanide of 3 to 4 ppb. Astro3 cites from the paper where their procedure has been reported that the detection limit was 200 ppb. But astro3 does not address that Markiewicz et al obtained their detection limit from their calibration. There is no apparent reason why we should accept Epstein's limit above Markiewicz et al's. Detection limits for cyanides at the order of ~ ppb have been reported in photometric studies in the literature in the past years (see for instance the papers citing Epstein). In “Advice from a cyanide expert” astro3 again fails to definitely connect the use of hydrogen cyanide with the formation of Prussian Blue in the homicidal gas-chambers, which would be however crucial in order to put the experts advice a meaningful context. The cyanide expert is also critical of detection limits at the order ~ ppb, which is in contradiction to many published papers like Cacace et al. in “Spectrophotometric determination of aqueous cyanide using a revised phenolphthalin method” (Analytica Chimica Acta 589 (2007) 137–141) with a cyanide detection limit of 5 ppb. I don’t have the expertise to judge what is correct and also if Markiewicz et al. 's detection limit is reliable at all. But even if not we don't obtain an argument suggesting the physical impossibility of the homicidal gas-chambers (Hannover's working hypothesis). “‘The Killing was Easy’” is critical of Höss description of the gassing, “None of this can have happened, its not physically possible”. There is just one problem: astro3 does not demonstrate it was not. Let us summarize what Höss said of what he could actually know (by own inspection or from subordinates): they threw in the Zyklon-B, waited for 30 minutes, opened and noted everybody was dead (lets add “likely dead” since of course they did not check every individual). I fail to see what is supposed “impossible” with this picture and astro3 does not show. Next is “For comparison - a Delousing Chamber” which also does not explain to us the physical impossibility of homicidal gas-chambers. Now it get’s interesting as this next posting is called “Impossibility of the Human Cyanide Gas Chambers”. If we don’t find proof for impossibility of the homicidal gas-chambers as alleged, then I don’t know where else! After talking about the holes (the positive evidence for which he does not discuss even though it was published well before the time of the posting), he argues that the homicidal gas-chambers had no convection or heating and because of this he guesses (!) it would take “at least two hours for a morgue the size of Krema-II to build up the requisite concentration in all four corners, the bare minimum here being 300 ppm”. Guessing is nice, but how about showing it was like this? In order that this “definitively violates the Hoss story”, the story about 300 ppm being in the corners after at least two hours has to be established first, including discussion what impact temperature physical violence, physical weakness, reduced oxygen, increased CO2 etc. has on the mortality in the homicidal gas-chamber and lethal hydrogen cyanide concentration. Also convection and heating caused by the people inside the homicidal gas-chambers needs to be taken into account. Astro3 also predicts (!) that upon removing the Zyklon B pellets after 30 min, “you would have at least 20% of the victims still alive and conscious, and another 20% unconscious and liable to recover”. Interesting prediction, but how about showing? In case I missed an argument, which is relevant, please point it out to me. So far I can conclude that in this thread in contrary to what Hannover promised me, it was not shown that “the 'gas chambers' as alleged” are “violating laws of science” or that “the alleged Auschwitz 'gas chambers' are utterly impossible as alleged”. There is just one thing which is interesting here. Can Revisionists show that cyanide outgassing of corpses would likely create concentrations of HCN high enough to prevent the Sonderkommandos of doing their work? If not, next question please. If yes, we can start considering this as an argument but first do the same calculation with gas masks. Actually Prussian Blue on the outside did not necessary have to penetrate through the brick from inside, unless you can rule out that they did not use cyanide solutions to desinfest large pieces like mattresses and laid them at the outside of the buildings. Last edited by Hans on Sun May 15, 2011 6:24 am, edited 1 time in total. Hans wrote: There is just one thing which is interesting here. Can Revisionists show that cyanide outgassing of corpses would likely create concentrations of HCN high enough to prevent the Sonderkommandos of doing their work? If not, next question please. If yes, we can start considering this as an argument but first do the same calculation with gas masks. Can exterminationists show that cyanide outgassing of corpses would create concentrations of HCN that would not prevent the Sonderkommandos from doing their work? We can deduce the toxicity of outgassing corpses from descriptions of the homicidal gassings. A rough screening of the descriptions indicates that there is no case described where a Sonderkommando was killed or severely effected (so he was prevented to this work) by hydrogen cyanide while removing the corpses. Thus, we can conclude that the cyanide outgassing of corpses did likely not result in HCN concentrations which prevented the Sonderkommandos from doing their work (with or without gas mask). This is kind of empirical evidence. Even though we do not know and have modeled the full chemical and physical processes involved, we can follow from the observations and descriptions that a critical concentration was usually not achieved. 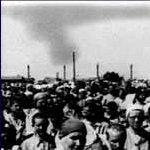 If Revisionists disagree that cyanide outgassing of corpses was no severe problem, even though it follows from what I mentioned above and is based on actual evidence, the burden of proof is on them to model those chemical and processes and show that the cyanide concentration should have reached critical levels.